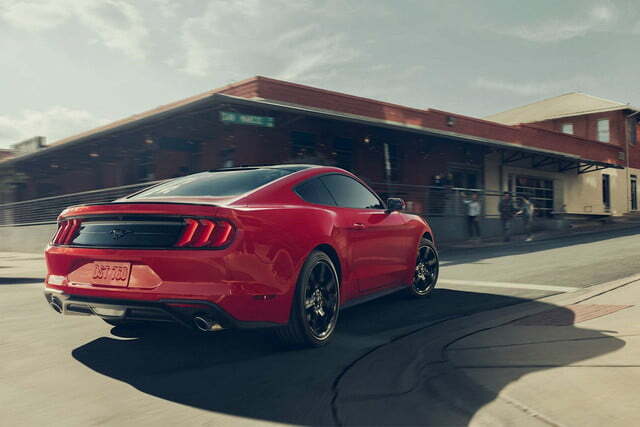 The question to answer when choosing a 2018 Ford Mustang isn’t, “Do you want to go fast?” but rather, “How fast is fast enough?” From the 301-horsepower EcoBoost model, to the 460-hp Mustang GT, to the 526-hp Shelby GT350R, your pony choice depends on how far you want to turn the go-fast dial and how wide you’ll open your wallet. 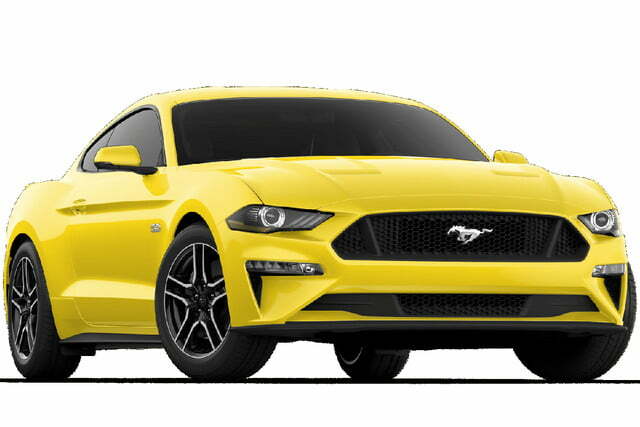 Following a leak, Ford originally officially introduced the updated 2018 Mustang in January 2017. The new car has a more muscular look and new tech features inside, but the V6-powered model has been dropped. The mid-cycle update brings new sheet metal from the A-pillar forward. The headlights are smaller than the ones on the previous model and each headlight has three short strips of LED daytime running lights. 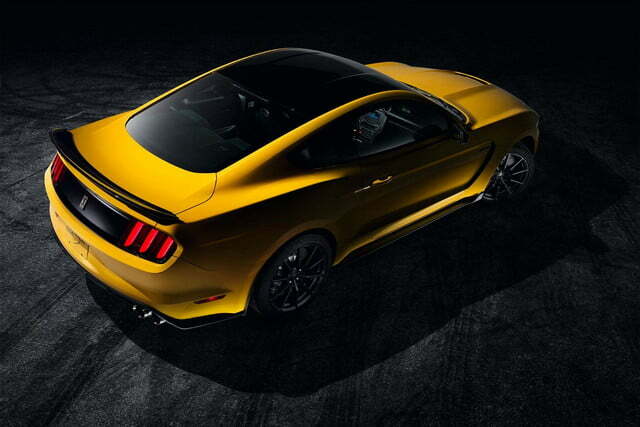 It’s a modern interpretation of one of the original Mustang’s defining styling cues that cleverly provides the 2018 model with a new lighting signature. A redesigned bumper, a lower hood, and horizontal turn signals round out the updates up front. Moving to the back end, the changes are largely limited to a revised bumper and redesigned LED taillights. New alloy wheel designs, several additions to the color palette, and a bigger spoiler that is available at an extra cost round out the major updates. As expected, the naturally aspirated 3.7-liter V6 engine has been dropped from the Mustang lineup. 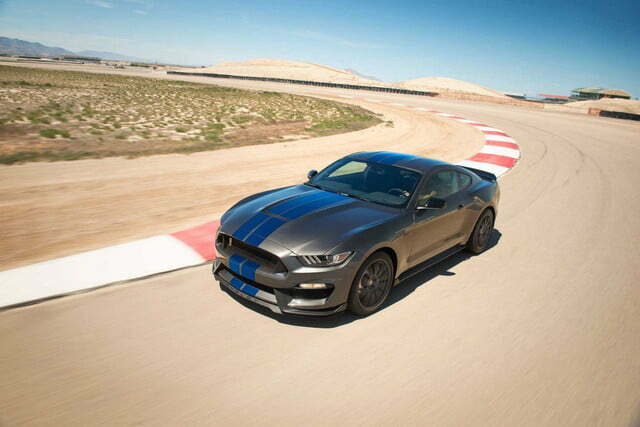 The pony’s car entry-level engine becomes a turbocharged, 2.3-liter EcoBoost four-cylinder. 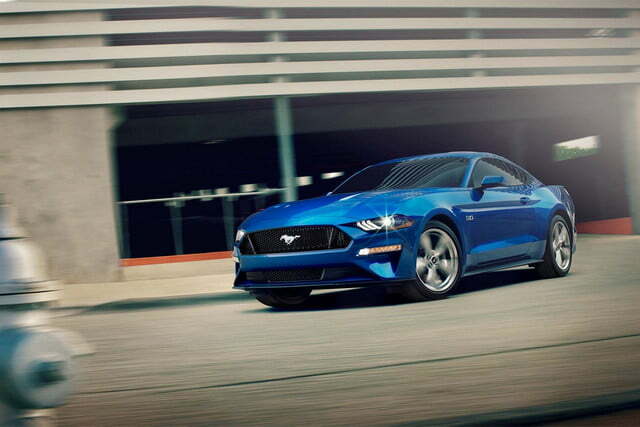 Enthusiasts who want more power can step up to the GT model, which is powered by the Blue Oval’s 5.0-liter Coyote V8 engine. The mill has been comprehensively re-engineered, and it now uses both direct and port fuel-injection systems to deliver more power and better gas mileage. 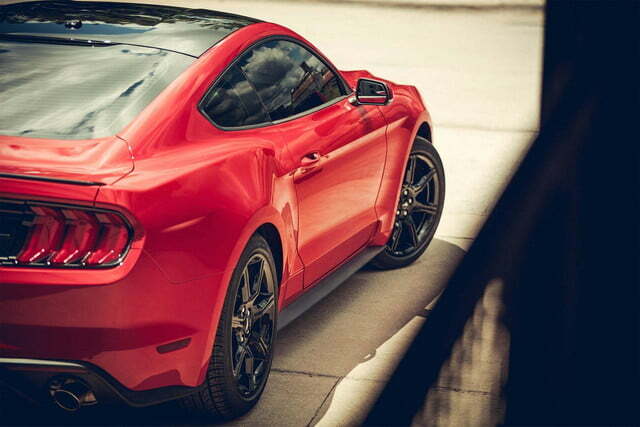 However, Ford won’t publish fuel economy or performance figures until closer to the Mustang’s on-sale date. 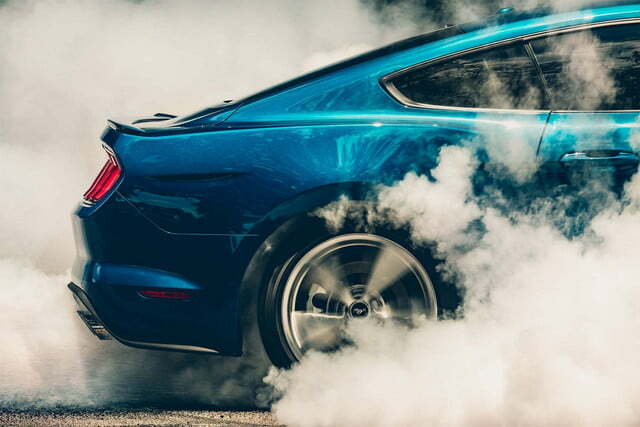 If the 460-hp 5.0-liter V8 doesn’t scratch your itch sufficiently, the Shelby GT350 and GT350R use a 5.2-liter flat plane crank V8 for a rollicking 526 horsepower and 429 pound-feet of torque. Transmission options include an enthusiast-friendly, six-speed manual transmission and a brand-new 10-speed automatic that replaces the current car’s six-speed unit. Ford promises the 10-speed delivers better low-speed response and reduced friction losses. Real-time adaptive shift scheduling ensures the transmission is always in the right gear, though steering wheel-mounted shift paddles are available for drivers who want to give their fingers a good workout. The two Shelby’s row the gears with a TREMEC 6-speed manual, the only choice. 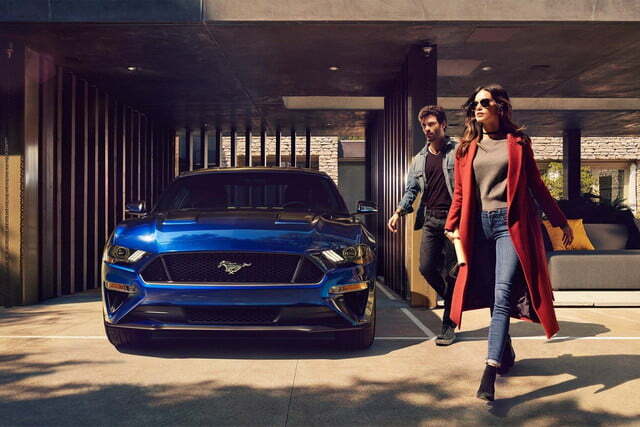 The Mustang is all about performance, but Ford has packed more high-tech features into its iconic pony car than ever before. 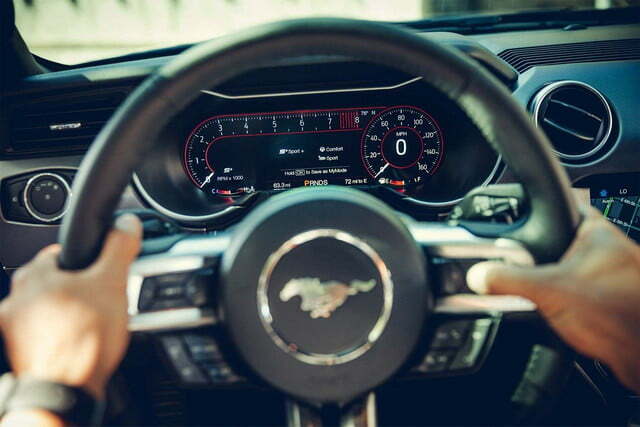 The Mustang is one of the first Ford products offered with a digital instrument cluster. The optional 12-inch LCD unit offers three separate views that are fully configurable. It can be set up to display different information for the normal, sport, and track driving modes. 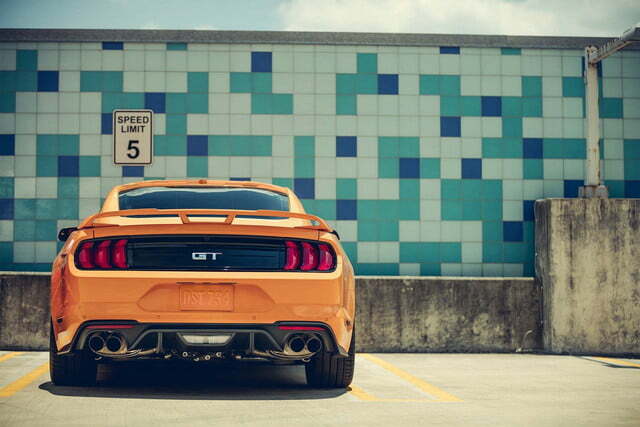 Ford points out that even the Mustang’s exhaust note can be personalized via an optional active-valve exhaust system. The list of available electronic driving aids has been expanded to include pre-collision assist with pedestrian detection, distance alert, a lane-departure warning system, and lane-keeping assist. Owners can use a smartphone application named FordPass to start, lock, unlock, and locate their car. Finally, the optional Mustang Performance Package includes an adaptive suspension named MagneRide borrowed from the Shelby GT350. 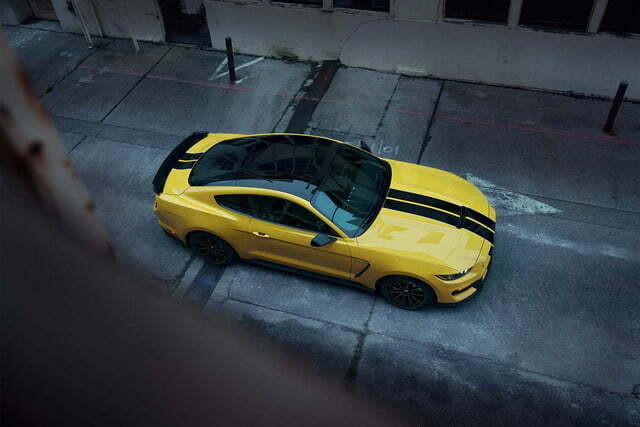 The GT350 and GT350R drop many of the comfort, convenience, luxury, and passive safety features to save weight and reduce cabin clutter. Nine distinct 2018 Mustang trim versions range in base price from $25,585 for an EcoBoost Fastback to the Shelby GT350R’s $64,645 starting tag. 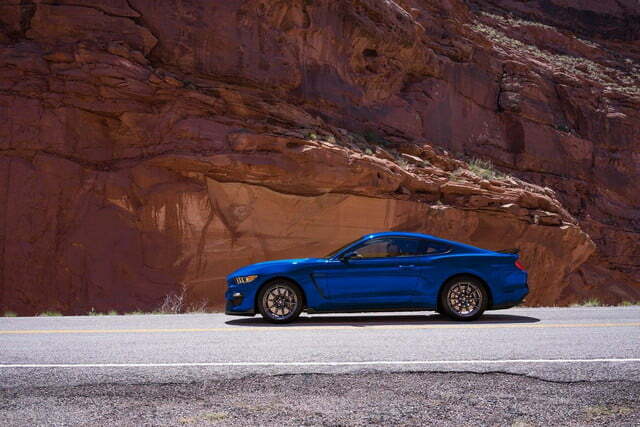 There are four EcoBoost trims, three Mustang GT trims, and two Shelbys. We’ve broken them out with feature differentiation descriptions and tables below. 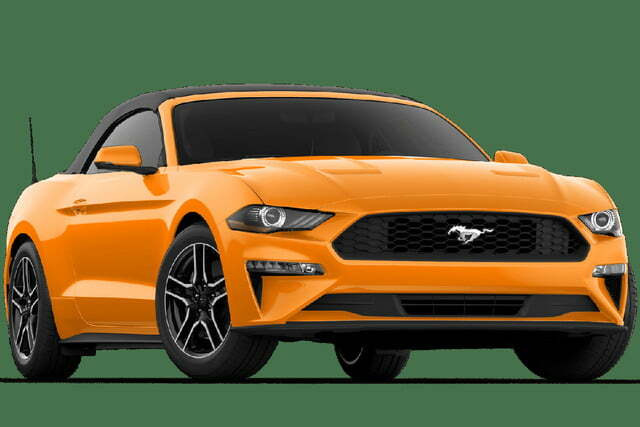 Two fastbacks and two convertibles comprise the 2018 Mustang EcoBoost models. The EcoBoost trims share the same turbocharged 310-hp 2.3-liter engine, manual six-speed transmission, and independent rear suspension. Ford’s 10-speed automatic transmission is a $1,595 option. If you want to stick with a four-cylinder engine but still bump up the go-power, the $2,495 Ecoboost Performance Package and $1,695 MagneRide Damping System may be appealing, but you might consider bumping up to the GT before making that leap. 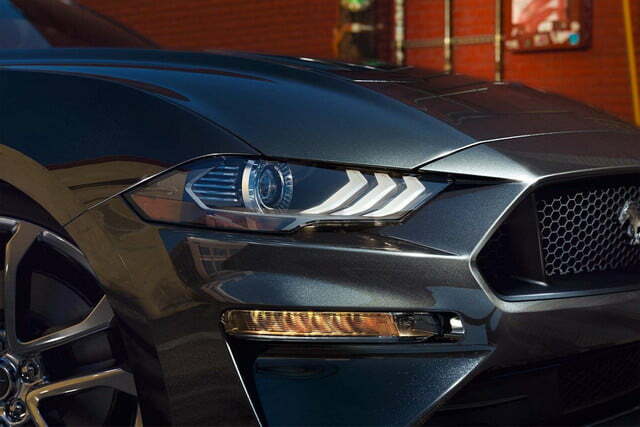 The entry-level 2018 Mustang EcoBoost Fastback starts at $25,585 with automatic LED headlamps, and LED signature lighting, turn signals, and taillights. The fastback include an auto-dimming rearview mirror, manual A/C, smart access and push-button start, and a leather-wrapped steering wheel and brake handle. Creature benefits include power windows, a six-speaker stereo with AM/FM and single CD, Ford’s SYNC system, and cloth seats. All EcoBoosts have a rearview camera, SOS post-crash alert system, individual tire pressure monitoring, perimeter alarm, remote keyless entry, and a passive anti-theft system. 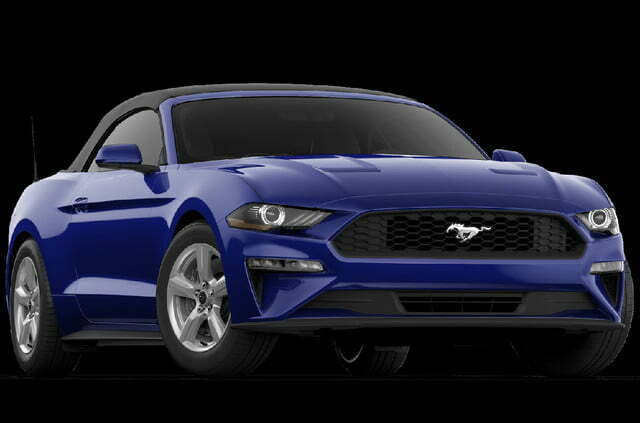 For an additional $5,500, which equals a $31,085 starting price, the 2018 Mustang EcoBoost Convertible has the same feature set as the fastback plus a convertible power top. 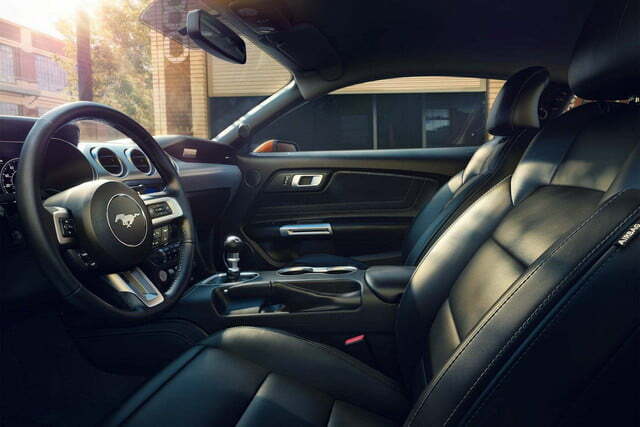 The 2018 Mustang EcoBoost Premium Fastback, starting at $30,600, adds a long list of comfort, convenience, near luxury, and safety features to the basic EcoBoost trim. 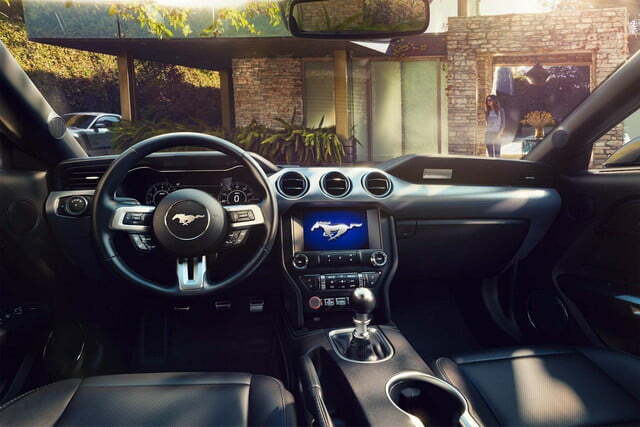 EcoBoost Premium versions, both Fastback and Convertible, gain blind spot monitoring with cross traffic alert, LED fog lights, dual-zone automatic climate control, aluminum foot pedals, ambient lighting, and a universal garage door opener. The Premium’s infotainment system has nine speakers, SiriusXM Radio, and SYNC 3. Seating is improved with a six-way power seat with power lumbar control for the driver, six-way power front passenger seat, and leather seat trim plus seat heating and cooling in front. The Premium also gains heated side mirrors with integrated blind spot mirrors and turn signal indicators. Ecoboost Premium trims with the manual transmission only also gain Ford’s launch control for maximum speed off the line. The EcoBoost Premium Convertible starts at $36,100, again $5,500 more than the Fastback version. 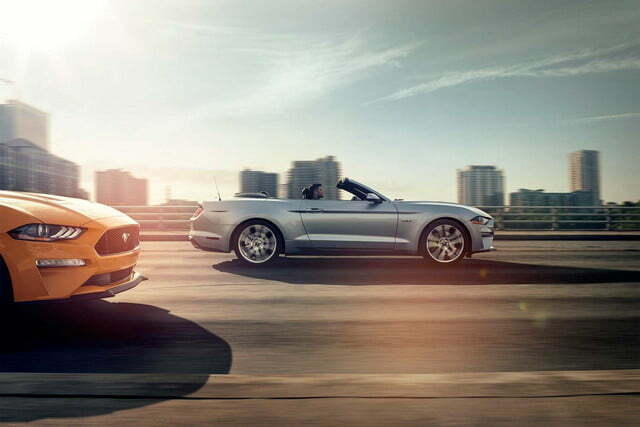 Otherwise, the convertible’s equipment list mirrors the fastback. 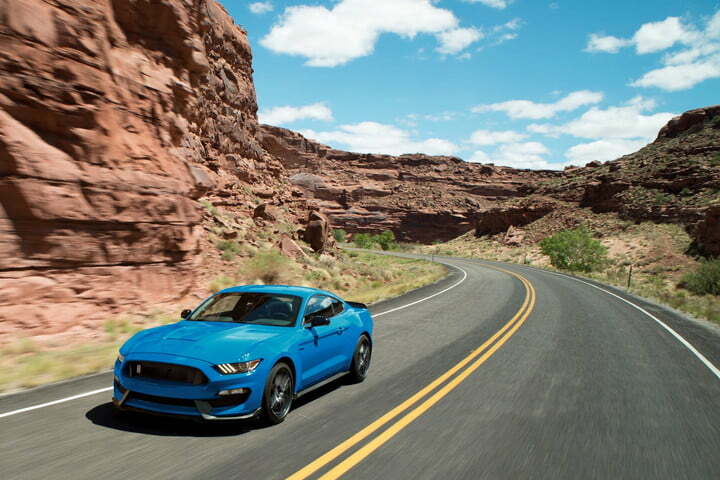 For many Mustang traditionalists, the two most important checklist items are the 5.0 V8 and the manual transmission — anything less pales the whole experience in their view. 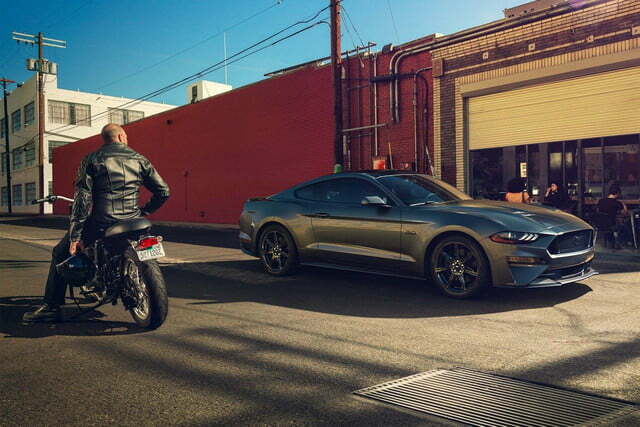 Ford wisely doesn’t deny Mustang fanbase preferences, for 2018 added a neighbor appreciation feature to the Mustang GT, the Good Neighbor Mode. This selectable exhaust noise level enables but does not require the driver to cut the sound level on startup. Other settings include Normal, Sport, and Track on the chance that GT owners would prefer not to muffle the exhaust. 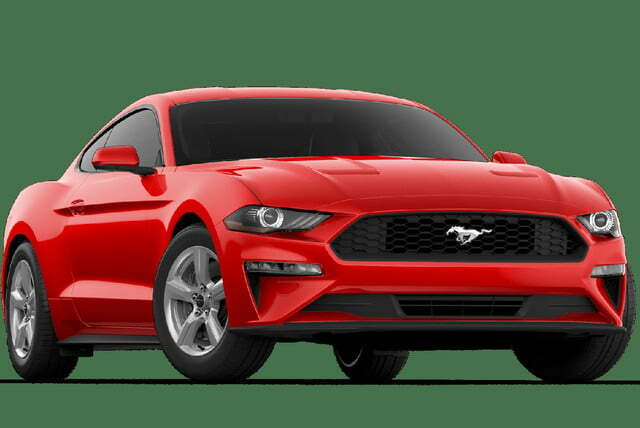 The basic 2018 Mustang GT Fastback, starting at $35,095, has all the features of the basic EcoBoost Fastback plus side mirrors with integrated blindspot mirrors, the 5.0-liter V8 engine, an engine oil cooler, dual exhaust with quad tips, and a raised blade decklid spoiler and rear diffuser. 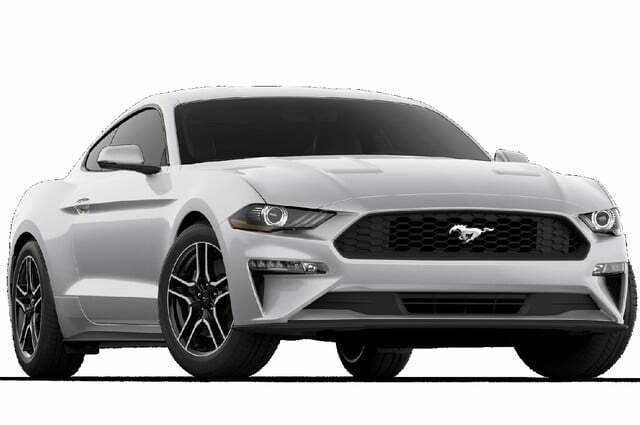 Add the Mustang GT Fastback features plus the upgrades in the EcoBoost Premium Fastback to get the GT Fastback Premium, starting at $39,095. 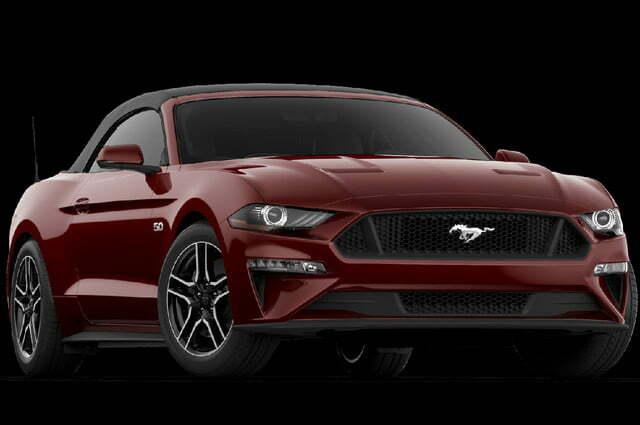 The top of the GT trims, the 2018 Mustang GT Premium Convertible, $44,595 starting, carries the full feature set of the GT Fastback Premium plus the convertible top, a blade decklid spoiler, and an electronic locking center console. If you’re not planning to take your Mustang Shelby GT350 or GT350R to the track, you’re missing out, especially with the GT350R. For 2018 the Mustang Shelby GT350, $57,145 to start, has all the features of the GT Fastback minus many of the creature features, including rear seats. 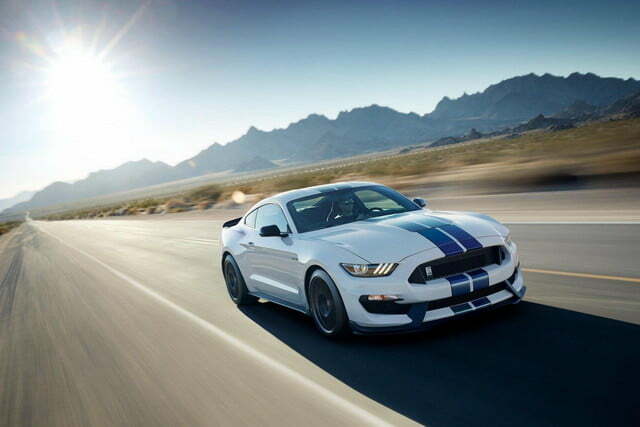 In addition to the 5.2-liter flat-plane crank V8 and Tremec six -speed manual, the GT350 has differential coolers, transmission coolers, and dual exhausts with electronic values and quad tips. Other performance items include cross-drilled disc Brembo brakes, integrated driver control system, 19-inch aluminum wheels with Michelin Pilot Super Sport tires, and the ride-flattening MagneRide Damping System. The Shelbys also have HID headlamps with signature lighting, manual climate control, Shelby exclusive aluminum instrument panel applique, a leather/Alcantara-wrapped steering wheel, and Recaro cloth/Miko suede sport seats. 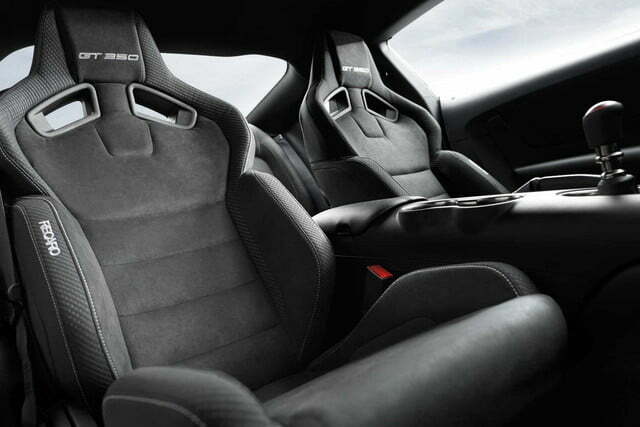 You’ve heard of carbon fiber, used in supercars and race cars for its strength, stiffness, and lightweight. You likely have not heard of carbon fiber wheels before and for sure not on a production car. 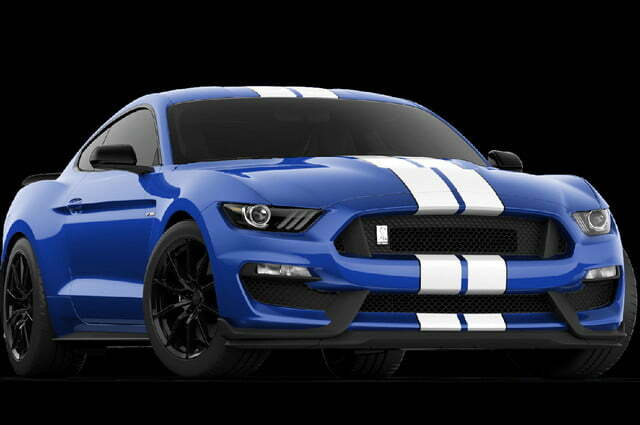 The GT350R, base price $64,645, is the first production car with standard 19-inch carbon fiber wheels. The wheels are fitted with especially sticky Michelin Pilot Sport Cup 2 tires. 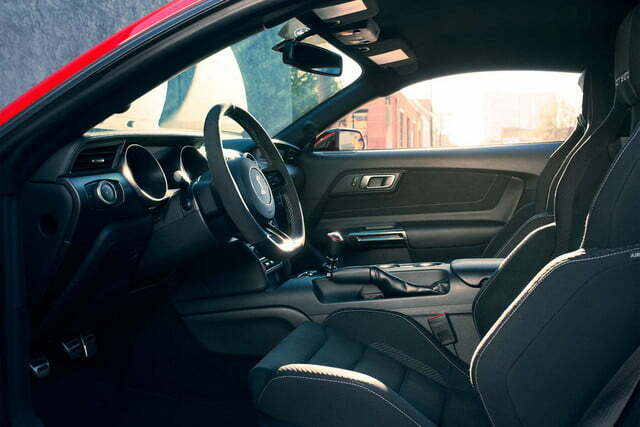 Other features on the $7,500 upgrade from the already hot GT350 include a front splitter, a carbon fiber rear wing, and a leather/Alcantara-wrapped steering wheel with Shelby red sightline.